The Navari Family Endowed Chair will provide funding in support of Stahelin’s research such as lab personnel and equipment, graduate student assistance and other needs of an active scholar and teacher. The chair was funded by former IUSM-SB associate dean and director Rudolph M. Navari, M.D., Ph.D., FACP, and his wife, Jane. “I am honored to receive the Navari gift, as he has been very supportive of my career, and an inspiration to me,” Stahelin said. Stahelin’s much-noted research on lipid-protein interactions has enhanced understanding of a wide range of diseases including Ebola, cancer, malaria and heart disease. In addition to teaching and research at the IUSM-SB campus, Stahelin lectures at IUSM-Northwest-Gary and is interim senior associate director of the Harper Cancer Research Institute, a cancer research partnership between Notre Dame and IUSM-SB. In 2013, IUSM named Stahelin one of four inaugural Showalter Scholars, an honor that acknowledges a young scientist for a strong record of research and external awards. 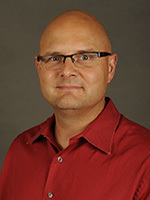 He was promoted to associate professor with tenure in 2012. He also has been the recipient of an IU Trustees Award for teaching excellence and was named a St. Joseph County Chamber of Commerce Forty under 40 recipient. Stahelin holds a doctorate in chemistry from the University of Illinois at Chicago, where he also served as a postdoctoral research associate and visiting research assistant professor. He joined the IUSM-SB campus in 2006. Originally published by Gail Hinchion Mancini at harpercancer.nd.edu on June 09, 2015.